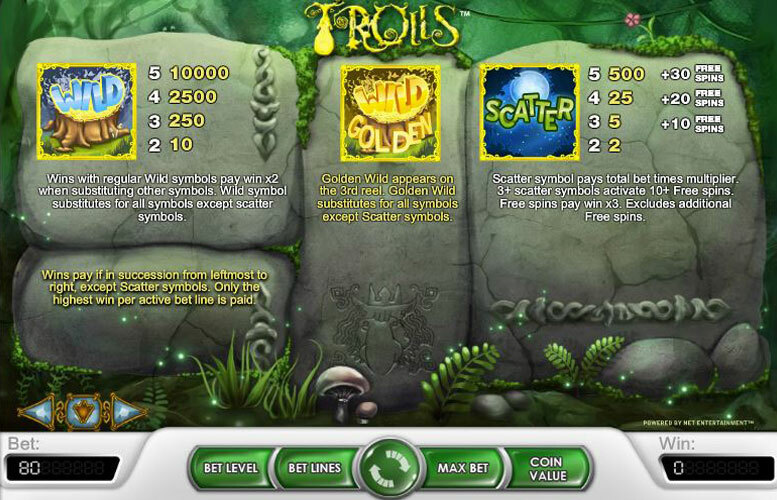 Trolls features two wilds, which help you win and multipy your winnings, and a scatter symbol which produces free spins (up to 30) where winnings are again multiplied. The top jackpot is 120,000 coins so get spinning and start winning! 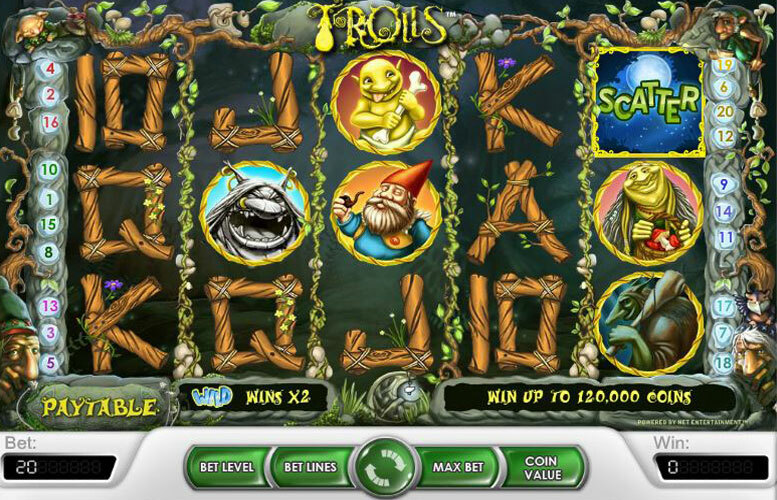 The Trolls slot machine game takes you down into the depths of the darkest caves where trolls are hiding around every corner. Only these trolls are different than the average evil trolls; the more trolls a player accumulates on an active payline, the more money will be awarded to them. This slot game has tons of great features and easy ways to win. All a player must do to win is acquire a matching set of trolls from the leftmost part of the reel to the right, except for the scatter symbols which can be placed anywhere on the board. This 5 reel, 20 payline slot game also features free spins and a special Golden Wild substitute which can increase a player’s winnings significantly. The design of this game may not attract a lot of players, but the available winnings definitely make the game a popular one. In order to win the greatest amount in Trolls a player must be betting the maximum bet per line, like most other slot machine games and be playing the highest bet level possible (level 4 on this machine). In Trolls, the maximum possible jackpot is set at 120,000 coins. To win this you must spin in five consecutive wilds (the Tree), which includes a Golden Wild on the 3rd reel as this triggers a x4 multiplier on your payout. Wild: The wild in Trolls looks like a tree stump with the word “Wild” in bright blue across the icon. The wild can substitute for any other symbol except for the scatter. If a wild creates a winning pattern the amounts can increase greatly. For instance if a player receives 2 wilds on their reel, they can earn up to 10 coins. If a player receives 5 wilds on their reel, they will earn an amazing 10,000 coins. You get a x2 multiplier on any wins including a regular wild as well. Golden Wild: The greatest feature associated with Trolls is the golden wild. This icon is hard to overlook as it is a bright gold color with the words “Wild Golden” shining across it. This will only appear on the 3rd reel and can substitute for all other icons. It will pay the player with a x4 multiplier whenever it appears. Scatter: The scatter in Trolls has a midnight theme, with the moons and stars in the background and the word “scatter” written across the icon. If a player receives three or more scatters anywhere on the board, the player will receive a certain amount of coins plus free spins. During the free spins the player will receive an additional three times multiplier on all of their winnings. The greatest amount a player can receive with 5 scatters is 500 coins plus 30 free spins. Troll 1: The first and highest paying troll in the game of Trolls looks like a golden creature with long grey hair and a golden hat. This troll rewards players for every pattern of 2 of more on an active payline, beginning with 3 coins per pair of 2 and ending at 750 coins per pair of 5. Troll 2: The second highest paying troll looks like a tall golden creature with a big smile on his face. This troll will reward players for acquiring patterns of 3 to 5, beginning with a 25 coin prize for pair of 3 and a 500 coins prize for pair of 5. Troll 3: This troll is a dark troll holding a bat that will reward player’s 15 coins per pair o f 3, 100 coins per pair of 4, and 500 coins per pair of 5. Troll 4: This scary troll has his mouth open, just waiting to chomp; however he begins his rewards at 10 coins per pair of 3 and ends with 250 coins per pair of 5. Troll 5: This golden troll holding a bone offers the same payouts as troll number 4. Gnome: The gnome in Trolls will reward players 10 coins for a set of 3, 50 coins for a set of 4, and 200 coins for a set of 5. “A”: The first of the letters, A will reward players 5 coins for set of 3, 50 coins for set of 4, and 150 coins for set of 5. K, Q, and J: These all reward players 5 coins for 3, 25 coins for 4, and 125 coins for 5. 10: Last but not least a player will earn 2 coins for set of 2, 5 coins for asset of 3, 25 coins for asset of 4, and 100 coins for set of 5. In Trolls a player can bet between 1 to 20 bet lines with a range of 1 to 4 bet levels. Coins values must be set at either 0.01, 0.02, 0.05, 0.10, 0.20, 0.50 or 1. If you play just one pay line at the minimum coin value and bet level then it’s just 0.01p per spin. If you want to ramp things up and max out your limits then you play bet level 4, coin value 1 and all 20 paylines which works out at £80 per spin. This game has a rating of 4 / 5 with 622 total reviews by the users.